In my work, I met amazing and fascinating people – food producers, farmers and writers. One of these people is Victor O’Sullivan of Bluebell Falls Farm in North Cork near Charleville where he produces the most amazing Bluebell Falls Goats Cheese. I only went to see the setup but ended up spending an entire day there. I have to thank Victor’s wife Breda for her patience while Victor showed me around, introduced me to the goats and showed me the cheese hall. 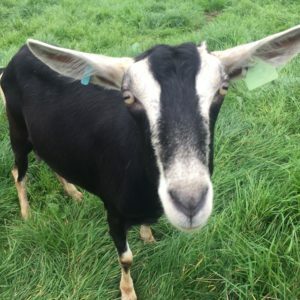 The goats are tame and very curious indeed – walking amongst them, they needed to know who I was and how my cardigan tasted. I left the farm with an armful of produce, even with a sample of a new product Breda and Victor are currently developing. My favourite (they are all delicious) has to be the Honey, Garlic & Thyme infused cheese log – a slight sweetness and hints of garlic and thyme – this combination is a match made in heaven and I was in trouble as soon as I tasted it (once you’ve tasted it, you can’t stop nibbling away on it). Steam the potatoes in their skins until just done. Set aside to cool. Cut each potato in half, lengthwise. Carefully scoop out the flesh, leaving the skin intact (make sure that the walls are strong enough to hold the shape). In a bowl, mix the potato flesh with the grated cheese and chives. Add a bit of cream to loosen the mix. Season to taste. Divide the mix between the potato halves, being careful not to tear the skins. Bake in the oven until cooked through, piping hot and slightly browned. 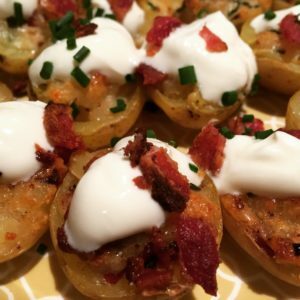 Arrange on platters, top with a blob of sour cream, sprinkle over the rest of the chives and crushed cripsy bacon and serve. 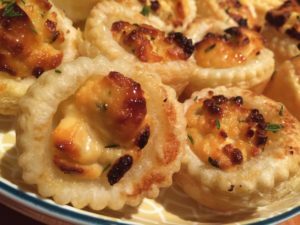 These are not really vol au vents but puff pastry tarts. Bring the puff pastry to room temperature before opening to avoid cracking. Straighten the pasty and cut small circles. Arrange in a 24-hole mini muffin tin. In a bowl, whisk up the goats cheese to loosen it. Divide between the pastry in the tin. Bake until puff pastry is golden brown. While the pastry is baking, place the honey and thyme in a small pot and warm up to infuse the honey with the thyme. Remove the pastry from the oven and arrange on platters. Drizzle over the honey and thyme and serve.